Innovation within tradition, the DNA of haute horlogerie, the movement heritage, and so on: forget it all. HYT does things its own way, and discards these received ideas. Need a known quantity to hang on to? Good news: the H4 Metropolis tells the time. As for the rest, you will need to forget anything that has been seen, designed, or even imagined before now. Nothing has changed, except the essential The chassis is a familiar beast. Since the start of the year, the H4 has had more ink in publicity than it has in its capillary. It is based on the same movement architecture as the H1, HYT’s inaugural piece, which has been completely skeletonised. With a 65-hour power reserve, it unveiled its sculptural mechanism for the very first time and opened up a new creative universe for HYT. One so appealing that the brand decided not to meddle with it: the new H4 Metropolis is virtually a carbon copy of its big brother. Or is it? Using this as its basis, HYT has returned to its favourite game: creating, surprising, sometimes unsettling, always astounding. This time the brand has applied a radiant idea, as brilliant as it is difficult to spot at first glance. Only eagle-eyed enthusiasts will have noticed an intriguing detail: the presence of two push-pieces. What could they be for, on a model with hours, minutes and seconds? 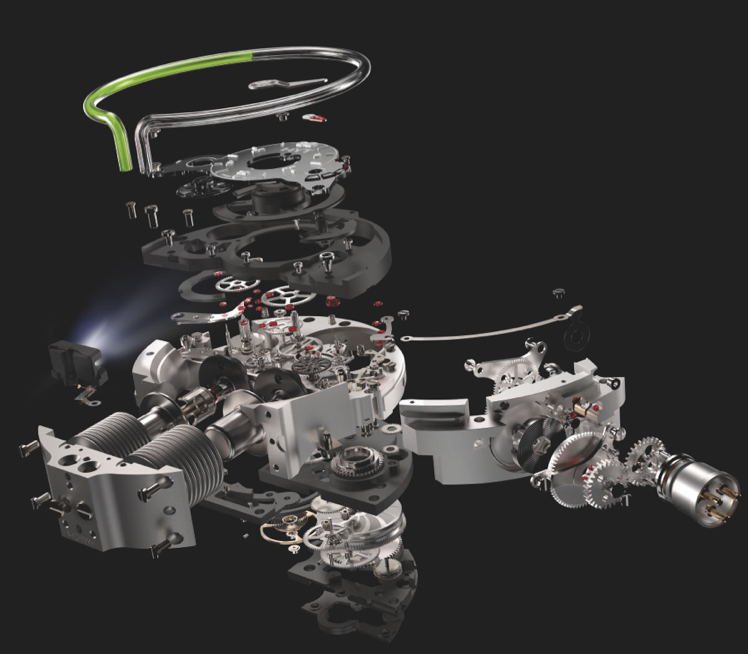 The answer is a first for HYT – probably in watchmaking as a whole. A fully illuminated project The H4 Metropolis is a piece equipped with a light source. Under the rider at 6 o’clock, HYT has concealed two LEDs. Once activated, they flood the entire dial with blue light. At night, the green fluid is energised by this light source, becoming perfectly visible. At the same time, the wash of light flows into every nook and cranny of the calibre, literally bringing this skeleton architecture to life, and defying the laws of watchmaking. The source of energy is purely mechanical. “Starting with a blank sheet is what we know. That’s how all our models have been created”, explains Vincent Perriard, CEO of HYT Watches. “But here, with the light complication, a new challenge was set: we had to start using our own existing calibre as a complete, functional basis. We basically had to add a piece to a puzzle which was already finished”.